Player characters live dangerous lives. Demons stalk them, dungeons crush them and paramours poison them with terrifying regularity. All that stands between character generation and your PC is a clever players. Yes, dice play a role, but over the long term canny players will out over the tyranny of chance. One of the key elements of a skilled player is situational awareness. At its fundamental level situational awareness (SA) involves seeing what is around you. That said, this is a poor definition that misses the subtlety of what SA actually represents. After much Googling I found a clean definition from the US Coast Guard of all organizations. Situational Awareness is the ability to identify, process, and comprehend the critical elements of information about what is happening to the team with regards to the mission. “Left of Bang” is a slang term for staying ahead of trouble, to make decisions before the bomb goes off that aid your mission. Once the bomb detonates you are “Right of Bang” and reacting instead of planning. Operating “Left of Bang” is always better. 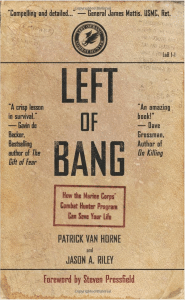 “Left of Bang” is a stripped down version of the Marine Corp’s “Combat Hunter” training program to help units deal with the ambiguous battlefield in the Middle East. Though marines are quite good at combat SA, the combat hunter training focused on the aspects of the battlefield that were present, but overlooked by conventional training. It most definitely leans more towards intelligence gathering and analysis of local, real-time information. The information is not sent back to analysis, the guy on the ground analyzes it and then acts immediately. I will not try to condense the book in a single post, but rather hit on a few key points I thought useful to RPG players. I broke it down into three main groupings, body language, patterns and finally, actions. LOB argues that facial expressions are an unreliable measure of intention. Instead, the authors encourage the use of gross motor actions, like hand and arm placement to determine intention or status. When observing a group of people on a street, the authors argue that the leader will have different body language than his subordinates. Obviously this is not to be used in combat when the guy at the back is shouting orders. Leadership in this case is not in question. No, this is more for determine leadership in a street gang or insurgent group or even a group of local men having tea. Someone has status and identifying this individual is useful. As an example, a party of adventurers comes across six men playing cards on a street corner in a shady neighborhood. Rather than just start talking to the men, the LOB educated player asks questions of his GM, seeking more specific information. Does anyone seem to be spread out, taking up more space? Leaning back in exaggerated relaxation? Upright and erect when others slouch? These are indicators from the “Dominant Cluster” and imply leadership. Conversely, who in the group avoids eye contact, shrinks from contact and maintains a “closed” posture? These imply a subservient attitude. Though the book generalizations are true in a gross sense, I found these indicators to be the weakest in the book. Alone, they are nearly worthless, but the value does appear later when you factor in other elements of the situation. Using our previous example, our PCs spend several days lurking in our hypothetical shady neighborhood to garner intelligence on a local gang. Rather than focus on the individuals in the gang, they instead focus on the patterns, the flow of the neighborhood. LOB makes reference to “Natural Lines of Drift,” (NLD)which is a fancy way of defining the natural patterns of travel that the local community uses. A quote from an LAPD officer in the gang unit stuck with me as I read this section. Bolt holes, hidden paths, safe houses all constitute the NLDs of an area. Certain paths are simply better than others. Perhaps one street is often busy with traffic, so felons avoid it because nothing says “loser” like robbing a bank and then getting caught because of bad traffic. Other paths might appeal to the criminal element because of its secrecy or hidden handhold that allow a quick, climbing escape that only a local would know about. Perhaps a city guard with greased palms allows safe passage through his beat. In any event, given enough time even a dim cultist/criminal/evildoer will learn of the “best” route and use it to his advantage. Sadly, this also makes our villain predictable. Predictability will get you killed. NLDs provide routes, but often it is the destination that matters. These are “anchor points.” Whether terrorists or cultist, they need a location to plot their evil schemes. Often these anchor point are hidden or disguised. The cliche is the “Social Club” for the mafia, but do not fall into the trap that an anchor point need be a building. Five cultists gathering on a corner is an anchor points. Here is where it gets complicated. One needs to apply the body language indicators, NLDs and other indicators (read the book, there are a bunch) to determine if you are seeing a family reunion or a sinister gathering. Once you identify an anchor point, then decision must be made. As to what action to take, LOB offers two possibilities. For civilians (remember this book is meant for the real world) the options are, in order of preference, “Run, hide, fight.” I will keep that in mind the next time a co-worker goes postal, but for gamers the military version is more applicable. All too often I see tables of gamers get bogged down in the planning, trying to come up with some “Mission Impossible” plan when the simplest solution is often the best. More than one of the tables I ran suffered because they missed opportunities waiting for 100% confirmation of their assumptions or simply went looking for zebras when any donkey would do. Acting on partial information now is better than acting on perfect information later. Time matters. Bottom line is this post simply does not do the topic justice and I highly suggest you read the book and gain an edge in gaming (and some insight into the lethal threats soldiers face every day). That said, I found the entire exercise oddly affecting in my everyday life. I am by no means paranoid and do not see gun-wielding psychos around every corner, but my perspective is skewed. Just a bit mind you, but I find myself in my idle moments calculating traffic on a street, looking for anomalies in the people around me and generally seeing the world in a different way. Given that all education should force us to evolve, then this book achieved its goal with aplomb. PS. There are some technical, but interesting resources on the authors homepage : CP Journal. The Tyranny of Chance: How Often Should A Player Succeed?